Stay At Home and Have Our Former Prosecutor Fight Your Case. Call us now at 800-893-9645. 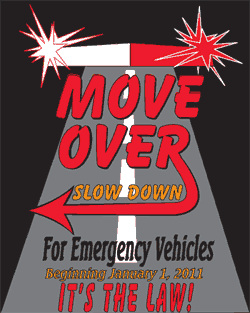 On January 1, 2011, New York became the 33rd major jurisdiction to implement a move over law. Basically, the law orders drivers to move over to another lane when they a police vehicle is stopped on the side of the road. The law is codified in the Vehicle Traffic Law under § 1144-a and was named in honor of the memory of officers Ambrose and Searles who were struck and killed by drivers who failed to move over while they were on duty. Drivers must use due care when approaching an emergency vehicle that displays red and/or white emergency lighting. § 1144. Operation of vehicles on approach of authorized emergency vehicles. (a) Upon the immediate approach of an authorized emergency vehicle equipped with at least one lighted lamp exhibiting red light visible under normal atmospheric conditions from a distance of five hundred feet to the front of such vehicle other than a police vehicle or bicycle when operated as an authorized emergency vehicle, and when audible signals are sounded from any said vehicle by siren, exhaust whistle, bell, air-horn or electronic equivalent; the driver of every other vehicle shall yield the right of way and shall immediately drive to a position parallel to, and as close as possible to the right-hand edge or curb of the roadway, or to either edge of a one-way roadway three or more lanes in width, clear of any intersection, and shall stop and remain in such position until the authorized emergency vehicle has passed, unless otherwise directed by a police officer. (b) This section shall not operate to relieve the driver of an authorized emergency vehicle from the duty to drive with reasonable care for all persons using the highway.